Grass-like plants,often informally called “graminoids” include the grassses (family Poaceae) and the sedges (Cyperaceae). These are the two species-rich, ecologically important sister families that comprise the order Cyperales. A 3rd, less often encountered group, the rushes (Juncaceae), resemble miniature wind-pollinated lilies but are closely related neither to the lilies nor the other graminoids. Grasses and rushes and sedges. Oh my! 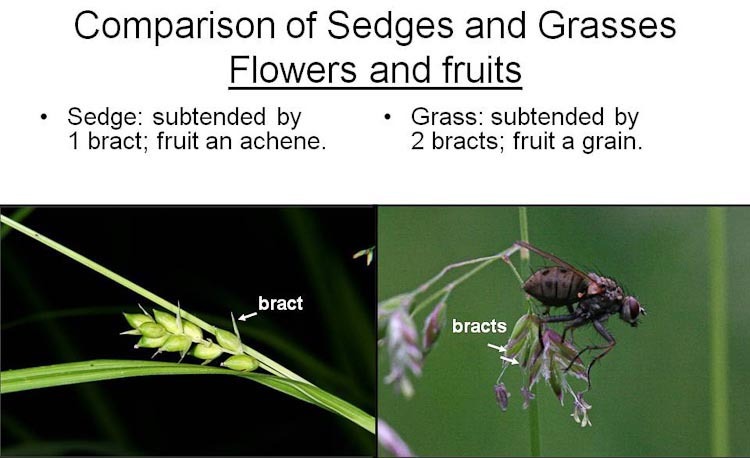 The principal graminoids are the sedges and the grasses. 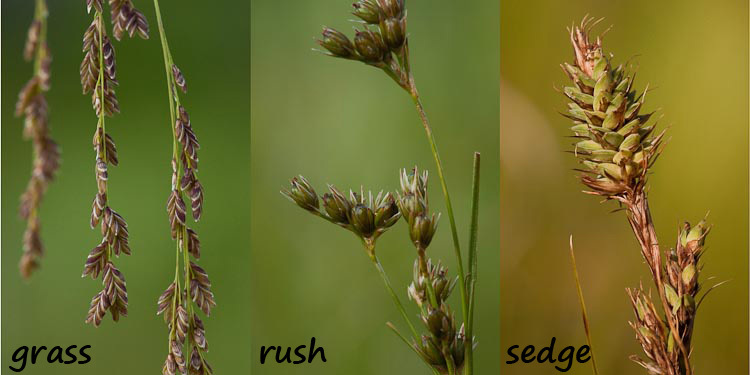 A catchy slogan helps tell sedges apart from grasses : “Sedges have edges.” The typical sedge stem is triangular in cross-section. 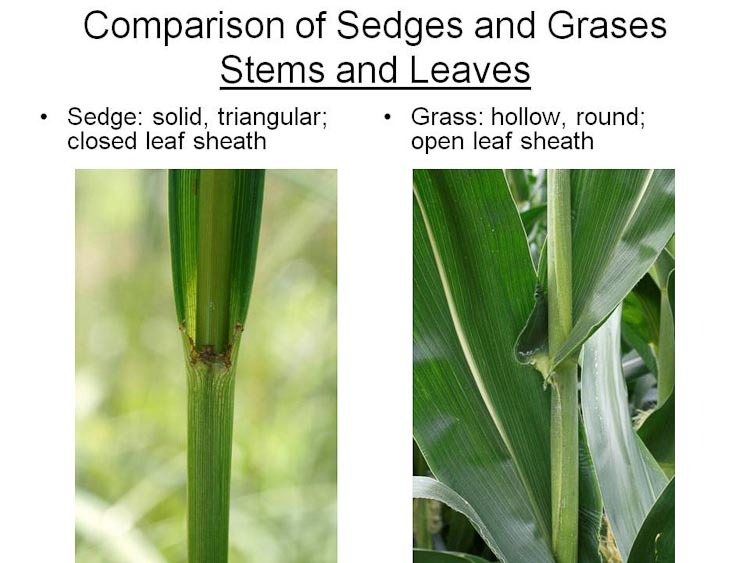 Moreover, the part of the leaf base that wraps around the sedge stem, called the leaf sheath, is closed in sedges, meaning that it is continuous around the stem on the side away from the leaf blade. By contrast, in most grasses the sheath is open, i.e., having free edges, one of which overlaps the other. Graminoids have tiny, wind-pollinated flowers that lack petals and sepals. They are subtended by specialized scale-like bracts, and aggregated into a special inflorescence type called the “spikelet” (a tiny spike). Sedge spikelets are often (but not always) composed of flowers arranged in tight spirals within which each flower is subtended by a single scale. 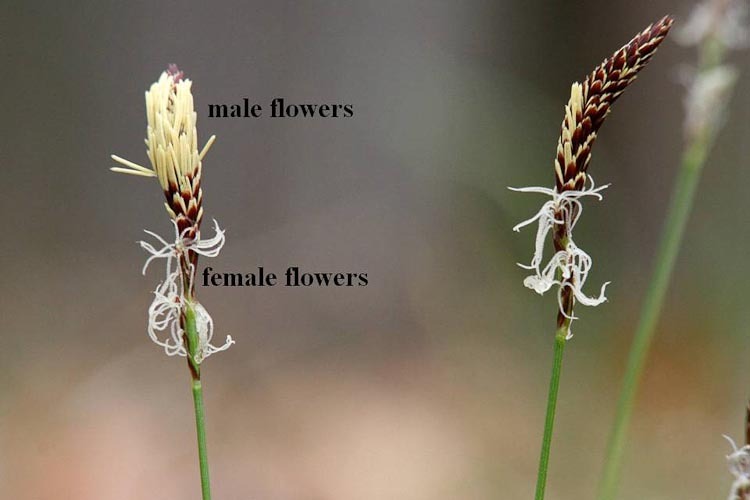 By contrast, grass spikelets are flattened with the flowers attached in two opposing ranks, and with a somewhat more intricate arrangement that includes additional scale-like bracts found only in grasses. Sedges and grasses have tiny wind-pollinated flowers arranged in spikekets. 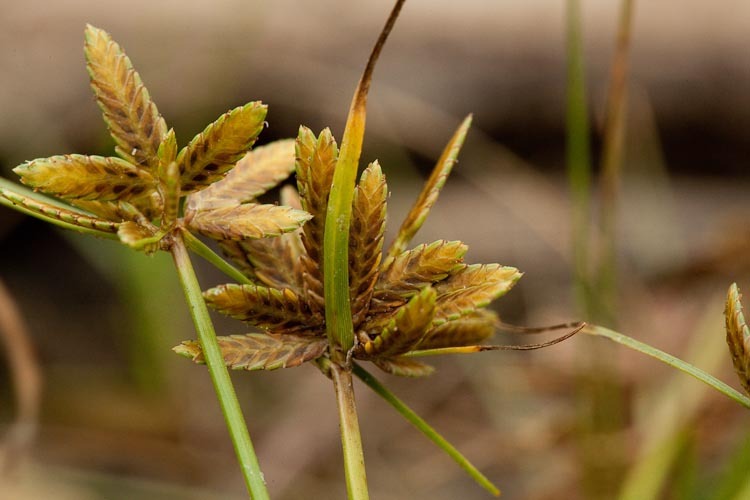 The sedge family is well-represented in Ohio, with approximately 230 species in 12 genera. However, most of our sedges (approx. 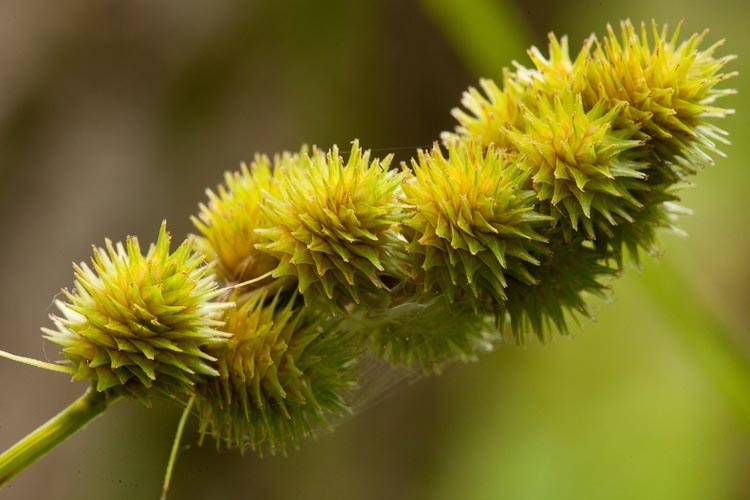 160 species) are members one one huge genus, Carex, which are distinguished in two ways from most other sedges: (1) Carex sedges are monoecious, i.e., having separate make and female flowers, but with both types on the same plant, whereas non-Carex sedges have perfect (biseual, hermaphoditic) flowers; and ; (2) they possess an additional, highly modified bract called the “perigynium” that forms a bag-like sac enclosing each female flower. Below, see two sedges. On the left, a representative non-Carex sedge (Eleocharis obtusa), in fruit resulting from flowers that were all alike sexually, each of which is subtended by just a single scale. On the right, a studio shot of Carex davisii showing its spikelet staminate at the base (evidenced by the fact that fruits are absent below and you can see withered remnants of stamens), and the achenes are enclosed in a sac, the perigynium. Most sedge genera (e.g., Eleocharis, left) have perfect flowers, each subtended by a single bract. Carex sedges (right) produce unisexual flowers; female ones are enclosed in a perigynium. A prominent non-Carex sedge genus is the one the family is named after: Cyperus, variously called flatsedges, nutsedges , or umbrella-sedges. “Flatsedge” is a good name because, unlike nearly all our other sedges, which have their flowers in tight spirals in their spikelets, the Cyperus spikelet is strictly two-ranked. Here’s one, “slender flatsedge,” Cyperus bipatitus. Slender flatsedge is a slender flat sedge. Another prominent non-Carex sedge genus is Scirpus, the bulrushes. 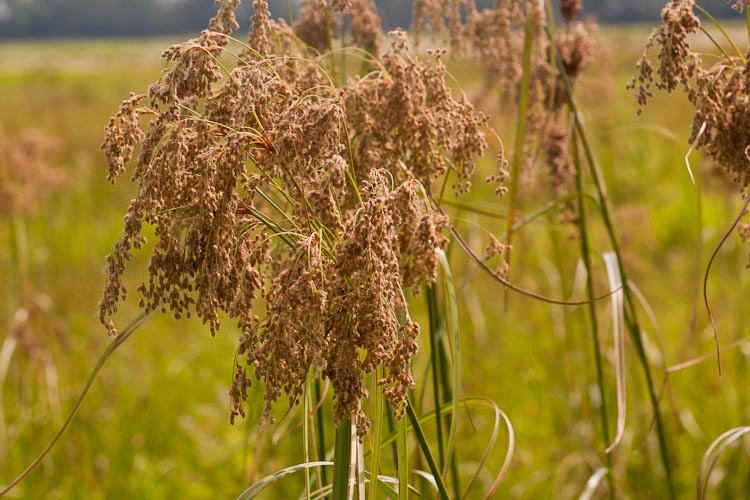 These are tall wetland plants valued for their benefit to wildlife. Ducks and songbirds eat the achenes while muskrats munch the rhizomes. Bulrushes produce a great many small cone like spikelets in a terminal cluster of either panicles or heads, giving several species a very bushy-topped appearance. The achenes are often surrounded by bristles. Here’s “wool-grass” (No, it’s not a grass! ), Scirpus cyperinus. Wool-grass is a bulrush sedge with achenes surrounded by wooly bristles. 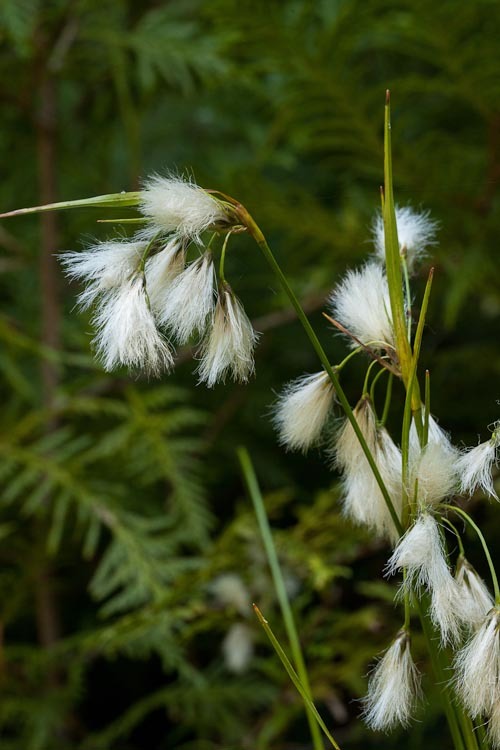 Speaking of sedges that are evocative of fabric and that also have misleading common names, what about “cotton-grass,” in the genus Eriophorum? These sedges with super-long bristles are fairly rare in Ohio, confined mainly to bogs and/or fens.Here’s dark-scale cotton grass, Eriphorum vridicarinatum at Cedar Bog (which is really a fen, i.e., a calcareous wetland) in Champaign County. Wool-grass is a sedge with very long bristles. Most of Ohio’s sedges are in the genus Carex. This huge genus is divided into two sub-genera and, within them, species-groups (also celled “sections”), based upon such traits as whether the spikelets are either all alike or instead are entirely pistillate or staminate, whether the flowers have two styles (and lens-shaped achenes) or have three styles (and trigonous achenes), whether the spikelets are attached singlt on the stem or instead are in branched arrays,etc. There’s also considerable diversity in habitats. 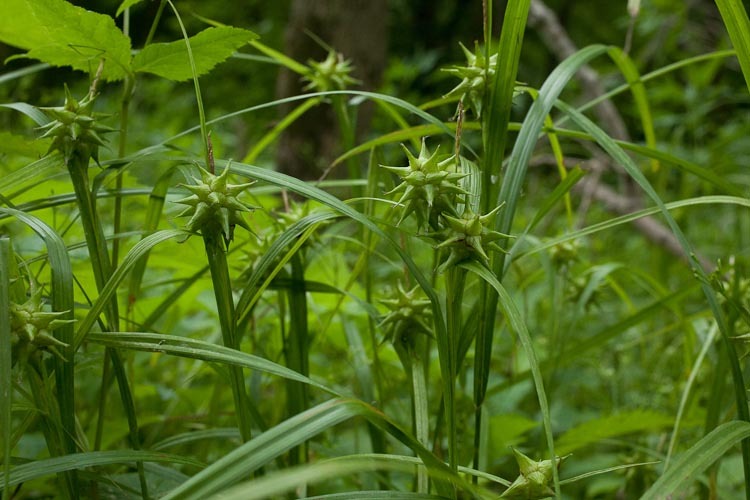 While many Carex sedges occur in wetlands as do most other sedges, there are a good many woodland, prairies, and meadow Carex sedges as well. 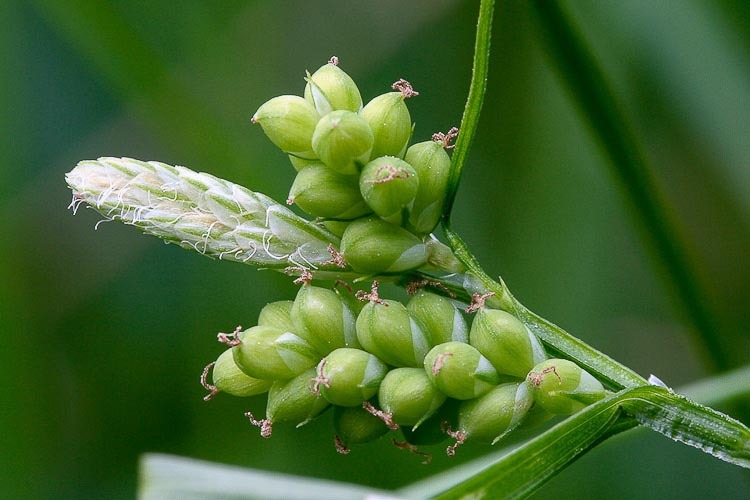 Here’s a woodland sedge in which the spikelets are staminate above; note the abundant large pollen-producing anther. The lower, pistillate, flowers include prominent stigmas that catch wind-blown pollen. A woodland Carex sedge in flower. 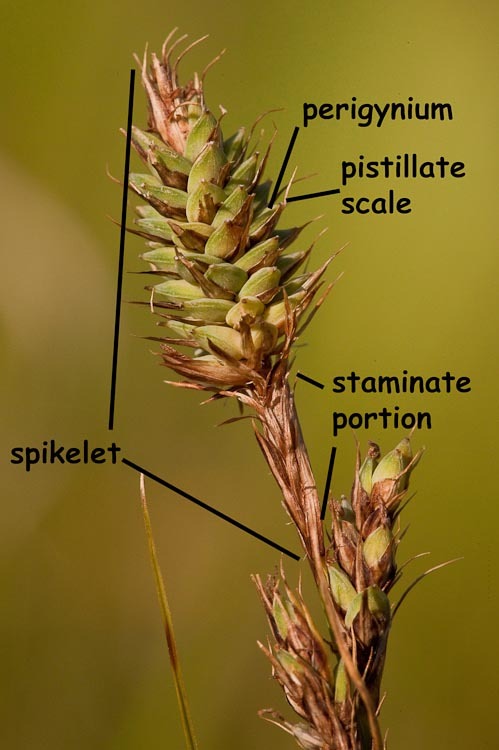 Upper portions of spikelets are staminate; lower portions pistillate. Here are a few of our more distinctive members of this great graminoid group.This is Carex buxbaumii, an uncommon wet prairie species that produces spikekets that are male at the base, anbd female at the tip. Notice also that the scales are awned. 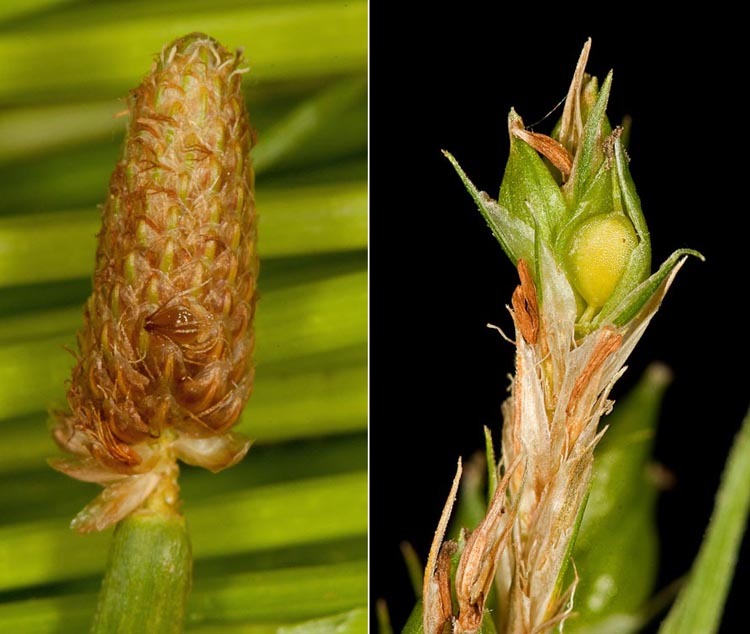 A Carex sedge spikelet may contain male and female flowers in different positions. Gray’s sedge, Carex grayii is a most distinctive species, common in wet depressions in wooded areas, that has spikelets that are entirely staminate (the terminal spikelet) and entirely pistillate (all but the uppermost one). The pistillate spikelets are globose, and the perigynia are large and beaked, so the sedge is reminiscent of a medieval mace. Gray’s sedge is kind of scary. Granular sedge, Carex granularis, also has a terminal spikelet that is entirely staminate, and the other entirely pistillate. It’s a small species of moist meadows and prairies, distinguished by having nearly globose short-beaked perigynia arranged in elongate spikelets. Granular sedge has nearly globose perigynia. Davis’s sedge, Carex davisii, is a woodland and moist meadow sedge that bears long, somewhat drooping spikelets that are entirely pistillate except for the terminal spikelet, which is staminate at its base. The pistillate scales are awned, giving the spike a rough appearance. 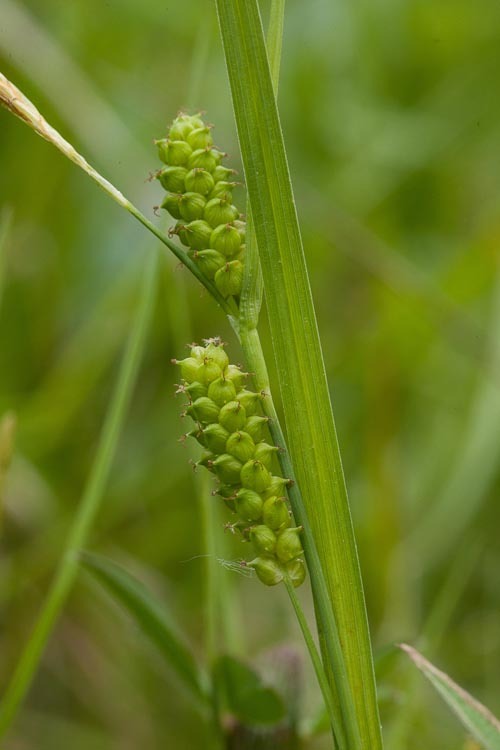 There’s an especially difficult species group, the “ovales” that consists of sedges with flat perigynia arranged in tight little cone-like spikelets that are staminate at the base. The species are distinguished by minute differences in shape and size of the spikelets, with a lot of disconcerting overlap. One species of the Ovales stands apart by virture of its beautifully wide-spreading perigynia. This is crested sedge, Carex cristatella., a common species of wet meadows..
Crested sedge perigynia are wide-spreading.